Nick Hendra, KSB '11, a freshman member of the AU men's basketball team in 2007-08, can still remember the highlights from that season. "What was really special for us…was the locker room time and the time spent on bus trips and airplane rides," Hendra says. The team also happened to win the Patriot League that year, the very first time AU men's basketball ever won a conference championship. He recalls the bonding moments with his teammates the most fondly, though. Hendra attributes the team's on-court success to the "special relationships we had…the camaraderie." He suspects they may never have reached a championship-caliber level of play without opportunities to cultivate a tight-knit team away from basketball. As a freshman learning to balance the rigors of playing Division I college basketball and a full academic course load, Hendra relied heavily on his teammates to develop the discipline needed to excel at both. Bus rides to and from games involved a lot of studying, particularly with his fellow Kogod students, including Garrison Carr; Brian Gilmore; Travis Lay; Steve Luptak; Jordan Nichols; Romone Penny; and Matthew Wilson. "What makes me most happy…is when I see people…come together and elevate [their work to] a level … that is beyond what anyone could possibly have imagined individually," Hendra says. "That's what made [our team special]." This is one of the key lessons he took away from his time at Kogod--and also what he's seeking in his professional career. Hendra currently serves as the director of brand partnerships at JWALK, a full-service creative agency in New York City that supports a diversity of companies. In addition to catering to Hendra's wide-ranging passions for finance, business, technology, and marketing, JWALK has also met his need for finding a team that he can work with. "One thing I really try to emulate in business is camaraderie, bringing people together," Hendra says. By coalescing internally as a unit, JWALK has been able to pursue innovative and creative methods to working with clients. JWALK has adopted a novel business model, where they accept equity in exchange for services, rather than traditional payments, for many of their engagements. This co-ownership approach brings JWALK and its clients closer together, as well, which leads to better campaigns that benefit the businesses they serve. If the creative campaigns that JWALK produces are successful, then the brand grows-and so does JWALK's compensation. Hendra said that JWALK also selectively chooses many of the brands the company works with, identifying companies that align well with JWALK's interest and mission. "I want people to feel like they are working for a higher purpose," Hendra says. By working at a company that "boldly goes against the grain," as JWALK claims in its mission statement, Hendra understands that creativity is imperative in everything he does. He credits his ability to innovate to a combination of his upbringing, basketball, and Kogod. Hendra says he gets his creative genes from his parents. His father has worked as an author, satirist, actor, and more. His mother serves as the global chairman for one of the largest advertising agencies in the country. Both of them encouraged Hendra to think creatively and accept the creativity of others. On the basketball court, Hendra says the game is "almost entirely creative … everything is artistic." From creating opportunities for himself or his teammates, success in basketball is contingent on one's ability to see a way to succeed that might not be obvious. But his professional originality, Hendra says, was solidified by his education. Kogod showed him "how your creativity can be applied to business," Hendra says. "Kogod helped me figure out where my creativity could be applied and how I was going to succeed at it." Hendra is proud of what he accomplished on AU's basketball court and what he's managed to achieve at JWALK, but he recognizes that his "wins" obscure the hard work he's put in. "All that people see at the end of the day is the finished product," Hendra says. "They don't see the diligence that went into the process." What he has achieved in business, and what he hopes he will be able to accomplish in his career, he sees as being built on the foundations of what he learned as an undergraduate. Those 18-hour days at AU included 5 a.m. workouts, 8 a.m. classes, basketball practices, study halls, and more. And Hendra knows he never would have gotten through all that without the support of his teammates. 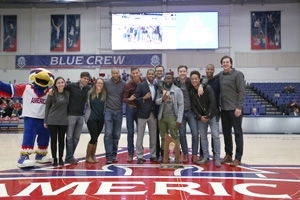 Learn more about American University's Kogod School of Business.